The ICANN-process for the introduction of New Top Level Domains is continuing. The Immo-domains are at the Golive-Period since 10th December 2014. You can pre-register here your name at the Immo-domain. The pre-registration is free, but compulsory. If we successfully register your domain, you will have to pay the domain fee of 60 US-Dollars per domain and year. "Immo" is an acronyum for Real Estate in many languages. 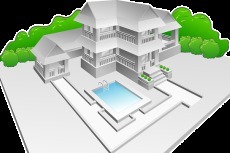 If you want to offer or sell real estate in Germany, Austria, Switzerland, then the Immo-Domains are the domains of 1st choice.